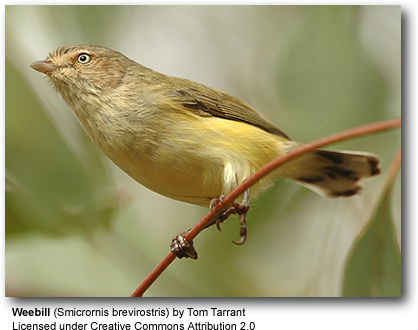 The Weebill, Smicrornis brevirostris is a small, up to 9cm long, olive yellow songbird with a grey bill, brown wings, pale yellow eye and grey feet. Its tail feathers are brown with black bar and white spot on tip of all inner webs but the central pairs. Males and females look alike. The Weebill is the only member of monotypic (one single species) genus Smicrornis. Australia's smallest bird, the Weebill inhabits to the woodlands and forests throughout mainland Australia. The diet consists mostly of insects and larvae. The female lays two to three brown-speckled cream colored eggs. Widespread and common throughout its large range, the Weebill is evaluated as Least Concern on the IUCN Red List of Threatened Species.